Climb a mountain and conquer yourself. If climbing mountains are your thing, you can’t forget about Kilimanjaro, Africa’s tallest mountain. Here’s everything you need to know about climbing Kilimanjaro. Only around 50% of the climbers who try to climb Kilimanjaro make it to the top. With a height of 5895 meters (19340 ft) Mt. Kilimanjaro is the highest mountain in Africa and the highest free-standing mountain in the world. To succeed at climbing Kilimanjaro, you have to do some planning and some preparation. Read on for the most important things you need to do ahead of time and on the mountain to conquer Kilimanjaro. The ideal times to climb Mt. Kilimanjaro are during the driest months of the year, especially January-February and August-September. Any date between January and mid-March or between June and October offers you decent chances of good weather on Kilimanjaro. Plan your climb for these times. Good weather can make a huge difference between making it and not. There are several climb routes up Kilimanjaro. They vary in length and difficulty. You will need to camp in a tent for all routes except one. The Marangu route requires you to sleep in huts and camping is not allowed. 5 days is the absolute minimum duration for a Kilimanjaro trek. However, if you can do it in 6 or 7, go for that option. Taking an extra day for acclimatization will greatly improve your chances to reach the summit. You can only climb Kilimanjaro with a registered guide or trekking agency. Thankfully, you don’t need to worry about the details. You don’t need to cook or put up your tent or anything. You just choose your Kilimanjaro tour operator. ONLY Trek With a KPAP Approved Company. 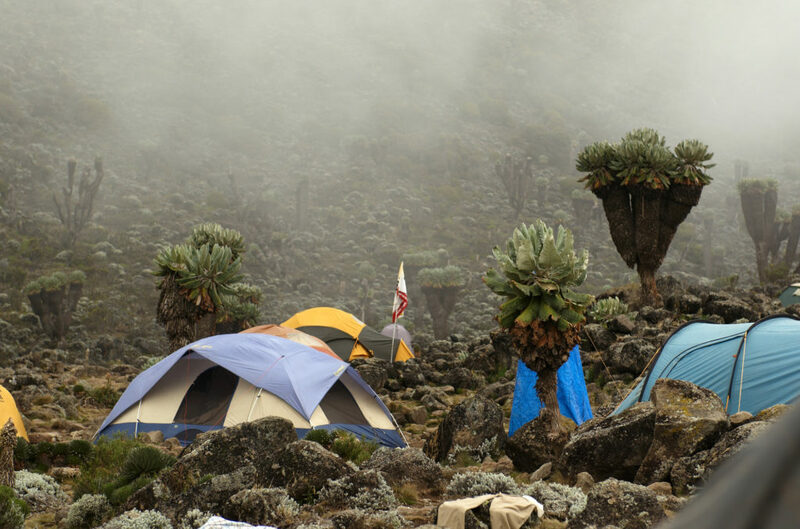 KPAP stands for Kilimanjaro Porters Assistance Project which is a non-profit organization that makes sure porters are given fair pay, appropriate clothing and gear, and adequate food to eat during their treks. Companies that are not a part of KPAP are known to pay porters next to nothing and even worse, not provide enough food during the climb. The right gear can make all the difference between having an incredible climb and hating the experience. Without proper walking boots and enough warm layers, you will hate every second. Get quality thermal gear made of fleece (not cotton which gets heavy with sweat), a down jacket, a Thermal-rated sleeping bag and hand warmers. This trip is not the time to skimp on quality. Planning to hang around in Africa after hiking Kilimanjaro? Check out 5 places to visit in Africa where you don’t need a visa. It’s normal to worry that you will run out of something you’ll desperately need at 18,000 feet. But an overly heavy backpack or a bunch of gear you don’t need is just dead weight that can hinder your climb. Check out this extensive Kilimanjaro climb packing list that details everything you need. Tip: bring a black ziplock bag to store your used wet wipes. You can’t leave any trash on the mountain. So after wiping, you’ll have to pack the wipe. Bring a black re-sealable bag so you don’t have to see the contents each time you go. This tip seems obvious but it’s vital. Get fit for the hardest, best workout of your life. Endurance training at the gym will help. But so will training hikes in your area before heading over to Africa. Before you go, make sure to take care of your feet. Break in your shoes, get a pedicure and make sure your toenails are nice and short. Blisters, hangnails and so on can make the Kilimanjaro trek difficult. Climbing Kilimanjaro becomes more about your mindset than your physical strength at some point, especially on summit night. When you do this ascent you will be crawling up loose scree in the middle of the night after 5-6 days of hiking. You will be tired, you will want to quit. You will need to uncover strength that you didn’t know you had. But when you get to the summit and stop to take in that sunrise – it’s phenomenal and absolutely worth every single second. Some people listen to music or audiobooks on this 7-hour ascent. Or come up with your self-talk that you will use to get you through it. Altitude sickness is real and can affect an athlete just as easily as a couch potato. Don’t be embarrassed or think you are weak for taking precautions. Join the line at the back and purposely go slowly. Your body has to work much harder at a higher altitude. Because the air is thinner up there, there is less oxygen to breathe. Walk slower than you normally would, and your body will thank you. Think tortoise and the hare. You will get there in the end by slow, steady steps towards the summit. Climbing Kilimanjaro is not a race. It is a group effort. The porters will be angels on the mountain, encouraging you and holding you up when needed. The more people you have looking out for you, the better. You will need allies to watch your back and to keep lookout as you pee behind a rock. Sharing candy from home will make you fast friends. They will also share with you. You’d be surprised how much a pack of skittles or goldfish on the side of a mountain can boost morale. You might be tempted to drink less to avoid the inconvenience of peeing at 15,000 feet. But the Kilimanjaro trek requires you to drink 3L of water each day. Ensure you have a CamelPak or Platypus instead of a bottle so that you don’t have to stop to unscrew a bottle top as you walk. When your hands are cold, the last thing you will want to do is take off gloves to unscrew a lid. And more than just water – take hydration salts. Put a sachet into a CamelPak or Platypus every day. Diarrhea is common at altitude so salts are your BFF when climbing Kilimanjaro. Hydration will also ward off possible altitude sickness. Climbing Kilimanjaro is probably a once-in-a-lifetime opportunity for you. Make it the best experience you possibly can with good preparation, smart packing and good allies who will support you each (sometimes painful) step of the way. Can’t get enough hiking? Make the Solheimajokull glacier your next goal. Check out 5 must-see Icelandic destinations.